Get ready for a football cliché so obvious and disgustingly tiresome it is sure to bring severe nausea to all who read it. The Blues need a key forward. While in reality, they need much more than that, this is a common concern that has haunted one of the AFL’s oldest and proudest clubs since what feels like the dawn of football itself. The exploits of mercurial forward Brendan Fevola aside, the 21st century has provided Carlton fans with largely nothing in the way of exciting tall forwards. In fact, many would go as far to say the Blues have been bereft of a reliable, match-winning key forward since the days of club captain and legend Stephen ‘Sticks’ Kernahan, who kicked a club record 738 goals during his illustrious 12-year career before retiring at the end of the 1997 season. Carlton’s leading goalkickers since Sticks’ retirement more than two decades ago include Fevola’s admirable 575 (third on the Blues all-time goal kicking list), Lance Whitnall’s 348 and Eddie Betts’ 290. 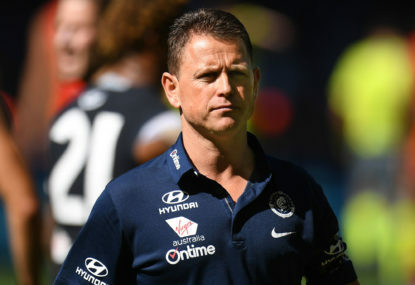 Goal-kicking has notoriously been Carlton’s Achilles heel for the duration of the 21st century, and continues to be an unwavering problem for a football club that now hasn’t kicked a score over 100 since a round 11 win over the equally toothless Brisbane Lions on the June 4, 2016. No club can attest to the football truism that ‘big blokes don’t grow on trees’ like Carlton. In what has been described by AFL talent scouts as potentially one of the great AFL drafts, the precocious Lukosius looms as arguably the drafts crown jewel. The gun South Australian forward has impressed footy scouts around the country at both club and state level over the past 18 months. Bursting onto the scene for South Australia with three goals from 15 possessions against the Allies in the NAB AFL under-18 championships in 2017, it was a performance coming later in the season that could in time etch itself into South Australian football folklore. Making his debut in the SANFL seniors for Woodville West Torrens, Lukosius trotted out and bagged four of his teams eight goals for the match. A remarkable feat for a 17-year-old playing against senior opposition for the first time. What makes this story all the more astonishing is that this performance from the gifted Lukosius came in a preliminary final. Just like fans will recollect being at Etihad Stadium to see a young Steele Sidebottom kick ten goals in a TAC cup grand final, and those who witnessed a skinny Lance Franklin kick the winning goal for Western Australia on the siren at Kardinia Park will boast about being there in years to come. Lukosius’ feats in that preliminary final have all the makings of a romantic football anecdote lucky witnesses will reminisce about when the young boy from Henley is making a Hall of Fame speech after having realised his enormous potential in the big league. It is imperative the Blues find themselves in a position to snare the next gun forward about to enter the big time. And let’s be honest, that means finishing last. While tanking has been the AFL’s dirty word for a long time, and Carlton have often found themselves in the thick of such controversy, getting Lukosius come November is critical. This will, of course, result in more short-term pain for long-suffering Blues supporters, who must surely be getting suspicious now that this is, in fact, long-term pain merely disguised as short-term. Those same Blues fans would also point to the fact the draft is a lottery and is not an exact science; having pick one rarely equates to inevitably drafting the best player. And those fans would be correct. In fact, list and talent managers inside AFL clubs often regard the facilities and development systems put in place by football departments superior to the ability to simply identify talent. Perhaps this is why clubs such as Sydney and Geelong always seem to be in premiership contention despite seemingly never bottoming out and having access to the valuable draft selections Carlton has in recent times. When it comes to naming those bungled first-round draft choices, it’s a sad dishonour roll of unfulfilled potential and flat-out busts that is sure to make Blues fans squirm. Since the turn of the century, Carlton have had access to 24 first-round picks. These players have serviced the club with a meagre 67.4 games on average, a number only propelled by the respective careers of former midfielder Bryce Gibbs (231) and captain Marc Murphy (240). From the ten draft classes between 2005 and 2014, the Blues netted 12 first round draft picks. Besides Murphy, only one player remains on the current list (young midfield gun Patrick Cripps) from those draft hauls. Kane Lucas (pick 12), Matthew Watson (pick 18), Josh Bootsma (pick 22), Troy Menzel (pick 11) and Blaine Boekhorst (pick 19) are all names that should make Carlton fans and recruiters alike shudder. If anybody wishes to see a blueprint on how to go to the bottom of the AFL ladder and stay there, there’s no need to look any further than the Carlton football clubs’ list management strategies of the 21st century. Having evidently been burnt a million times by the hope draft night can so often cruelly promise, Carlton fans have the right to be skeptical around the principle of losing to obtain valuable draft picks. They know better than most that high draft picks don’t necessarily equate to on-field success. Fans may also point to the fact their forward line currently consists of arguably the most exciting young player in the league in Charlie Curnow, as well as exciting developing tall Harry McKay. So, do they really need a forward? Yes, and they need the fair-haired Lukosius from South Australia. Lukosius has been likened by Doerre to a young Nick Riewoldt, such is the young guns sheer football talent and freak mix of endurance and athleticism. It’s no fun barracking for a footy team that is anaemic in front of goal and in turn finds itself on the wrong end of the scoreboard every week. Blues fans know this all too well. It’s unfair also to recommend such a despondent football club keep losing games in order to guarantee themselves access to a prized young footballer, having been aggrieved by many similarly talented young footballers in the past. In this current climate, however, the Carlton football clubs’ hands are tied. The Blues next draft blunder cannot involve passing on Jack Lukosius. Citing the fact they already boast young stars Charlie Curnow, Harry McKay and possibly Jacob Weitering to lead the forward line into the future simply won’t cut it with the long-suffering Carlton faithful. Lukosius is too talented for such a whimsical excuse. This young key tall prospect from South Australia is too good to pass up, and is just the type of player Blues fans have been praying for. 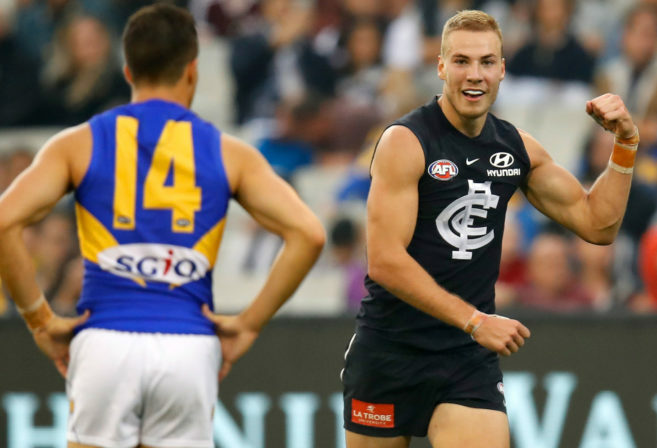 Jack Lukosius, without burdening him with too much expectation, is the kind of generational talent who can help change the fortunes of a club. Blues fans will be desperate to see this young man from Henley help lead the old dark navy Blues out of their almost two-and-a-half-decade slumber.